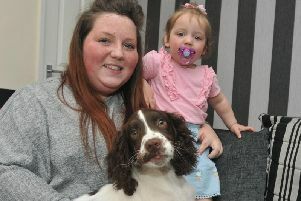 A local mum is bidding to raise awareness of the crippling bone condition from which she suffers. Rosey McNally has been diagnosed with avascular necrosis, known as AVN, at the age of 27. Involving a loss of blood to the bones, it began in one of her legs and has more recently spread to her pelvis. But while research is fairly advanced in the United States, Rosey has found that the affliction was little recognised in this country. And now Rosey, wife of former Leigh Centurions favourite Gregg, wants to redress the balance. Plans are under way for a sponsored walk from the Woodside pub at Ellenbrook, along the guided busway, to Toyfields in Guest Street, Leigh, where she used to work. The fund-raiser, which will take place on December 9, will start at 1pm and will be rounded off with a bake sale and raffle. Rosey, who now works for Cloud 4 Computers, is originally from Huddersfield, and Gregg is a Cumbrian native. But the couple, who now call Leigh home, have been overwhelmed by the support of their families and friends in the town. The family says that staff at Toyfields have also been “wonderful” in helping to arrange the day. Her mother, Lesley Littlewood, who is also supporting the walk and awareness campaign, added: “Very little is known about this complex disease, other than that it restricts the blood flow to the bones. “When Rosey has been looking into this, there is a fairly wide network of support in America but not as much in this country. “It’s a horrible condition and Rosey has had to cope with it while looking after two young children. The condition itself is usually linked to a serious leg break or the chronic use of cortisteroid drugs so it is rare, as in Rosey’s case, to develop AVN without those factors being present.